Police's final tour of duty. 2007 started with great news for Classic Rock fans: Police might be celebrating the 30th Anniversary of their first hit single "Roxanne" (and their very first single, "Fallout") by getting back together for a world tour. Awesome, the fans and critics say, they easily will fill stadiums and the audience is at the right age and economic level to afford "Rolling Stones" venues and prices. Since the release of Synchronicity, Sting, guitarist Andy Summers and drummer Stewart Copeland have played a few times together: in 1986 for a series of Amnesty International concerts, in 1992 for Sting's wedding and in 2003 when the band was inducted into the Rock And Roll Hall of Fame. The truth that hits everybody is this one: they can't stand each other, although this may be a marketing strategy. After releasing two mediocre solo albums in 1999 and 2003, Sting has become a pretentious snob playing 16th century lute music, Andy Summers plays more jazz than anything and Stewart is nowhere to be found besides writing music for movies. They don't remember when they were recording straight, no chaser rock songs like "So Lonely," "Message In a Bottle," and "Hole In My Life." 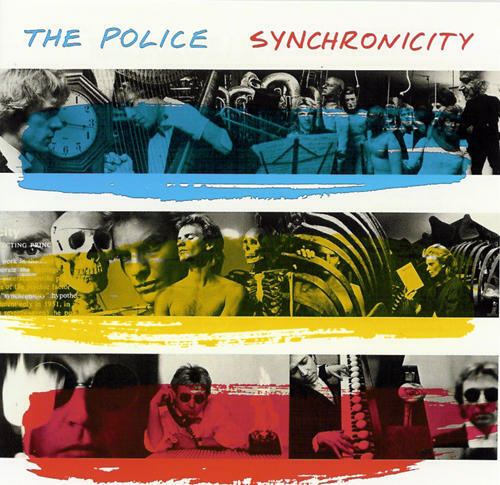 Synchronicity is an album where the listener recognizes Sting's dominance over all Police's music but that's OK. His points of view overshadows the ones of the other two and we get lots of synthesizers and weird noises that have anything to do with Police's first three records. However, Andy Summers manages to represent with his magical guitar and Stewart definitely proves he is the most successful drummer in the world, acclaimed by everybody. Synchronicity might be Sting's album, but it's Stewart's work. 6/4 time on "Synchronicity I," Hard 4/4 hitting on "Synchronicity II," elegant percussion on "Wrapped Around Your Finger" and "Walking In Your Footsteps." Every rock drummer who wants to improve their skills must have this record. At a glance, the two sides of the Synchronicity LP look like two different entities. The first is an introspective analysis of fate and coincidence, pretty much related to the studies of psychologist Carl Jung, who firmly believed in "meaningful coincidences," such as a beetle flying into his room while a patient was describing a dream about a scarab, an egyptian symbol of rebirth. Jung's notion of synchronicity is that there is an non-causal principle that links events having a similar meaning by their coincidence in time rather than sequentially. He claimed that there is a synchrony between the mind and the phenomenal world of perception, and based on this Sting creates songs that range from Nuclear Apocalypse to Loss of Religion. Andy Summers and Stewart Copeland bring a little of comic relief with their compositions, "Mother" and "Miss Gradenko," respectively. On the first, Summers doesn't look at Jung but at his mentor Freud to find an explanation to his poor dating skills. Copeland's is a catchy one about a U.S.S.R. desertor who shows affection for the West (by the way, Stewart's father was a CIA agent during the beginning of the Cold War). On "Synchronicity II" Sting gets back at us and finds the closest metaphore to Jung's theory: "Nessie" coming from the bottom of Loch Ness while, many miles away, Sting witnesses the breakup of his family by the monstruosity of modern life: "Mother chants her lethany of boredom and frustration/ but we all know her suicides are fake". The verses suggest that the family might have been murdered by a deranged father. The first side is adorable, and the second side offers us Police's biggest hit, Grammy Winner "Every Breath You Take," a simple song about a former lover who becomes a stalker, but no one seems to perceive the potential danger of this. "King Of Pain" puts Sting again on the spot of being cruel just to protect his emotions, a subject continuing on "Wrapped Around Your Finger". Lest not forget that he was going through a painful divorce during these years, leaving his wife for her best friend, Trudy Styler. "Tea In The Sahara" is a haunting tribute to Paul Bowles' novel "The Sheltering Sky" that closes the LP, but not the CD nor the cassette. That's the role of "Murder By Numbers," an Andy Summers-Sting collaboration about the reflections of a serial killer (or maybe the father of SII). The song doesn't quite match the mood of the album, but it's a nice novelty song that ends Police's album career. Synchronicity is, for many, Police's masterpiece. For me actually it doesn't match the honest speed, struggle and dissatisfaction of a bored post-punk generation expressed in records like Outlandos D'Amour (1978) and Reggatta De Blanc (1979). It doesn't show a cohesive band but the work of Sting as a solo artist trying to express himself, leaving his two partners estranged. This can be seen on the Synchronicity Concert DVD, where Sting, after introducing the band and the backup vocalists, doesn't even mention his name. Police disbanded after the Synchronicity Tour and Sting's first solo album, the relaxed and jazzy Dream Of The Blue Turtles, was nicknamed The Son Of Synchronicity, for obvious reasons: he wanted to leave the Police life for good. Synchronicity: Produced by Hugh Padgham & The Police. Released 1983. Tracks: Side A: Synchronicity I, Walking In Your Footsteps, O My God, Mother, Miss Gradenko, Synchronicity II. Side 2: Every Breath You Take, King Of Pain, Wrapped Around Your Finger, Tea In The Sahara, Murder By Numbers [bonus track on CD and Cassette]. Songs by Sting, except Mother by Andy Summers, Miss Gradenko by Stewart Copeland and Murder By Numbers: words by Sting, music by Andy Summers.